Break Even Analysis in economics, business, and cost accountingFinancial Accounting TheoryFinancial Accounting Theory explains the "why" behind accounting - the reasons why transactions are reported in certain ways. This guide will help you understand the main principles behind Financial Accounting Theory refers to the point in which total cost and total revenueSales RevenueSales revenue is the starting point of the income statement. Sales or revenue is the money earned from the company providing its goods or services, income are equal. A break even point analysis is used to determine the number of units or dollars of revenue needed to cover total costs (fixed and variable costsFixed and Variable CostsFixed and variable costs are important in management accounting and financial analysis. Fixed costs do not change with increases/decreases in units of production volume, while variable costs are solely dependent on the volume of units of production. 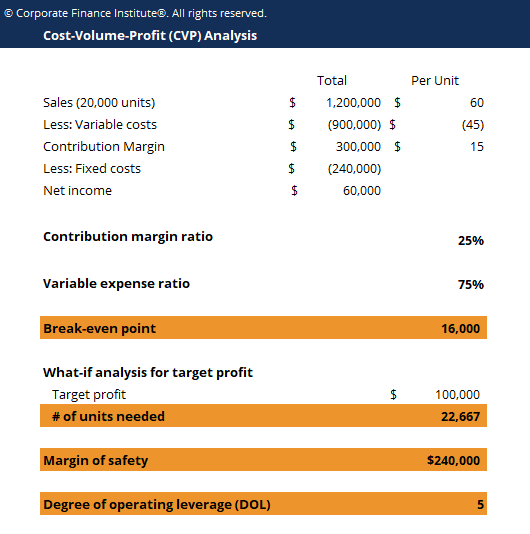 This guide teaches an analyst the fixed vs variable cost methods). It is also helpful to note that sales price per unit minus variable cost per unit is the contribution marginContribution MarginContribution margin is a business’ sales revenue less its variable costs. The resulting contribution margin can be used to cover its fixed costs (such as rent), and once those are covered, any excess is considered earnings. per unit. For example, if a book’s selling price is $100 and its variable costs are $5 to make the book, $95 is the contribution margin per unit and contributes to offsetting the fixed costs. Therefore, given the fixed costs, variable costs, and selling price of the water bottles, Company A would need to sell 10,000 units of water bottles to break even. The number of units is on the X-axis (horizontal) and the dollar amount is on the Y-axis (vertical). The red line represents the total fixed costs of $100,000. The blue line represents revenue per unit sold. For example, selling 10,000 units would generate 10,000 x $12 = $120,000 in revenue. The yellow line represents total costs (fixed and variable costs). For example, if the company sells 0 units, the company would incur $0 in variable costs but $100,000 in fixed costs for total costs of $100,000. If the company sells 10,000 units, the company would incur 10,000 x $2 = $20,000 in variable costs and $100,000 in fixed costs for total costs of $120,000. The break even point is at 10,000 units. At this point, revenue would be 10,000 x $12 = $120,000 and costs would be 10,000 x 2 = $20,000 in variable costs and $100,000 in fixed costs. When the number of units exceeds 10,000, the company would be making a profit on the units sold. Note that the blue revenue line is greater than the yellow total costs line after 10,000 units are produced. Likewise, if the number of units is below 10,000, the company would be making a loss. From 0-9,999 units, the total costs line is above the revenue line. 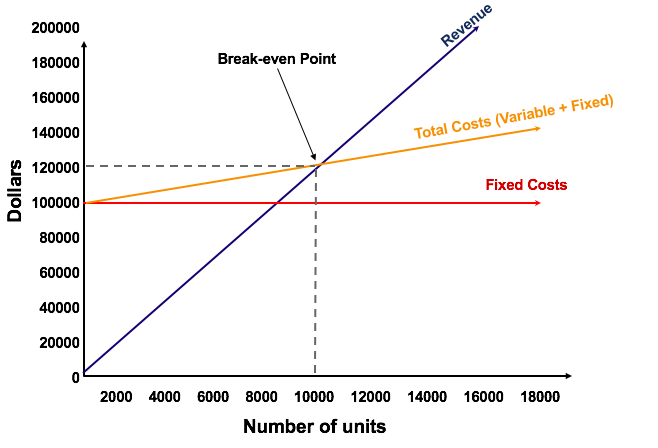 The break even analysis is important to business owners and managers in determining how many units (or revenues) are needed to cover fixed and variable expenses of the business. Break even analysis is often a component of sensitivity analysisWhat is Sensitivity Analysis?Sensitivity Analysis is a tool used in financial modeling to analyze how the different values for a set of independent variables affect a dependent variable under certain specific conditions. 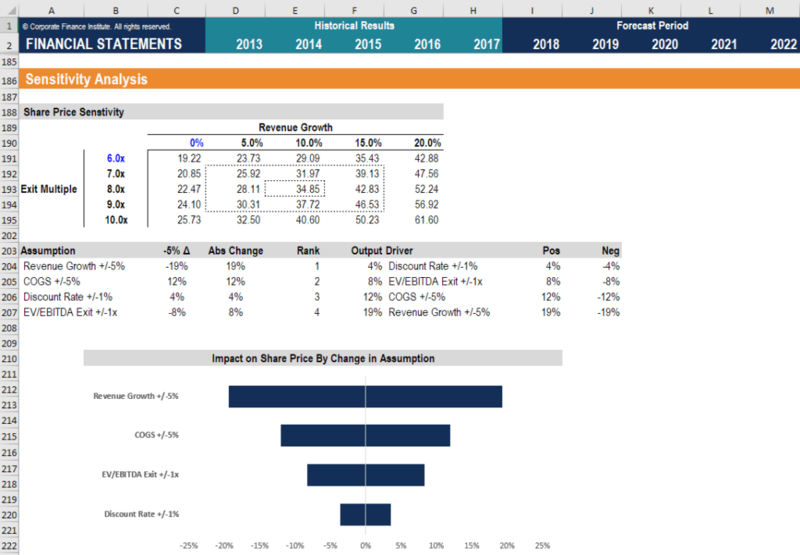 Sensitivity Analysis is performed in Excel to asses risks, measure potential outcomes, and plan for an uncertain future and scenario analysisScenario AnalysisScenario analysis is a technique used to analyze decisions through speculating various possible outcomes in financial investments. In financial modeling, this process is typically used to estimate changes in the value of a business or cash flow. By using the Choose or Offset functions an analyst can crease base case performed in financial modelingWhat is Financial ModelingFinancial modeling is performed in Excel to forecast a company's financial performance. Overview of what is financial modeling, how & why to build a model. A 3 statement model links income statement, balance sheet, and cash flow statement. More advanced types of financial models are built for valuation, plannnig, and. Using Goal SeekGoal SeekThe Goal Seek Excel function (What-if-Analysis) is a method of solving for a desired output by changing an assumption that drives it. The function uses a trial and error approach to back-solving the problem by plugging in guesses until it arrives at the answer. It is used for performing sensitivity analysis in Excel in Excel, an analyst can backsolve how many units need to be sold, at what price, and at what cost to break even.